I know you’re a passionately curious person. That’s why you’re here! You’re inspired by creative people, and you’re intrigued by the idea of being more creative yourself. You’re a bit guilty though, of spending more time scrolling than sketching. I’ve been there too. I get it. As humans, we all have an internal desire to create. Our brains are hardwired to be creative, and as children our creativity flourished. For most of us though, somewhere along our journey into adulthood, we’re told that we didn’t do it ‘right’, our creativity gets crushed and our creative potential gets locked away inside. We convince ourselves that we’re not a creative person, that we’re not the creative or artistic ‘type’. We think we’re not creative, and therefore we don’t cultivate our creative potential. We don’t spend time creating. I believe that the things that we loved as a child are probably the things we still love. The problem is how to remain an artist when we grow up, and how to remember the joy that making and creating once brought us. Deanna Maree Creative Studio is an online space where creativity is ignited and nurtured. As a virtual visitor, you are welcomed into this supportive studio environment where the only mistake you’ll make is thinking that you’re not creative! Here inside this creative studio experimentation is encouraged, imperfection is embraced, and we’re all about enjoying the process. Your inner artist will be unleashed, as we explore the things that spark the kind of joy that can only be experienced when you’re elbow-deep in paint, working with your hands, completely engaged and present in the moment. Here, inside this virtual Creative Studio we're all about..
Let’s See What We Can Create Together Shall We? Creativity is at the core of who you are as a human, and creative expression is essential to wellbeing and fulfilment. Everyone has unique gifts, and we all have hidden abilities buried deep within. It’s up to each of us to unearth, develop and nurture those gifts and abilities. I want to help you explore your creativity further, whether you think you have the ability or not. Join Me In The Classroom! Hello there! I LOVED this online course!! It has really motivated me to start doing what I have wanted to do for years...PAINT, but have been too intimidated. Thank you for such a thorough explanation of supplies needed, for such simple instructions for brush strokes and color mixing, and for your lovely encouragement to just start. I purchased my supplies and I can't wait to start! I loved your enthusiasm, artistic talent and skill, how well paced and thoughtfully organized the course is, your low key and very pleasant attitude, your emphasis on progress not perfection, and your clear pleasure in beautiful joyous flowers and textures. I also love how comfortable you make the student by showing mistakes you make and how you fix them - such an important lesson. I loved learning in privacy and at my own pace. Further, the course is so thoughtfully paced and organized that building on skills evolved smoothly and naturally. I was surprised by my own progress! I liked that everything was explained and demonstrated in a way that made each exercise not only doable but also fun. I liked that "bloopers" were not edited out but rather used as a teaching tool to show participants how to proceed with a 'fix' or how—even though gouache is a very forgiving medium—sometimes, you just have to 'turn the page and start over'; and, last but not least I like the fact that Deanna and Bloomin' Lovely Gouache have left me believing that someday soon I will paint with ease and confidence ... and actually enjoy painting. This course is brilliant! You have great teaching skills. I truly appreciate your encouraging, gentle manner. There are so many helpful tips and techniques that I cannot begin to list what I liked about the course. I will probably go back and watch it all again and make notes this time. 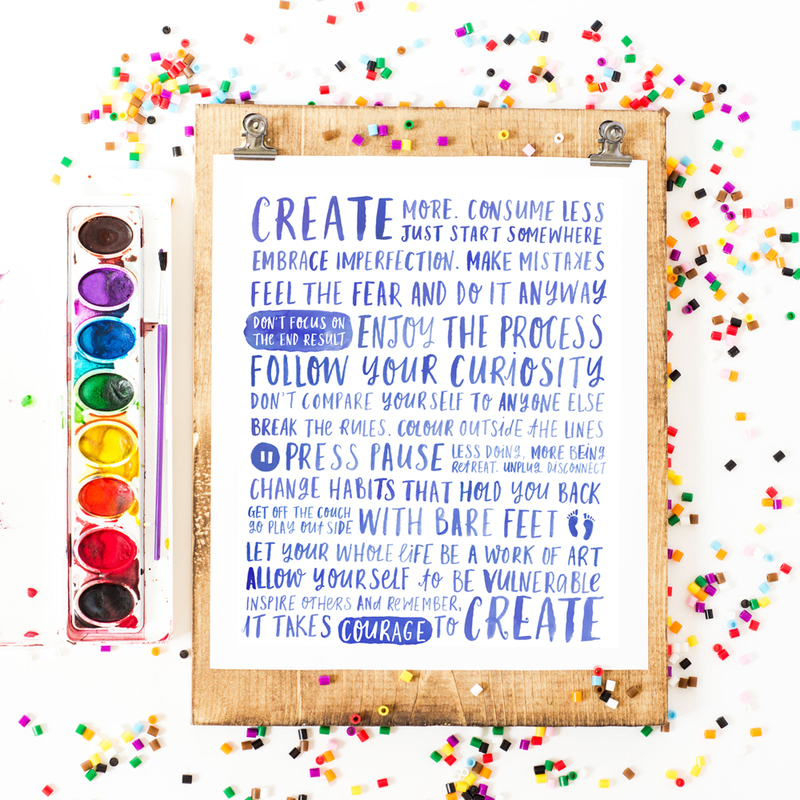 Get this free printable Create Manifesto when you become a subscriber! I designed it to give you a kickstart gentle nudge in the right direction when you’re feeling stuck! I’ll also inspire your inbox each month with a ‘Museletter’ containing my insights into the creative process as well as tips, tricks and new tutorials! I won't ever share your details with anyone, promise.